Trudi handed the quilted masterpiece back over at FQR, and I got it bound on the Saturday night (oh yes, I really know how to paint the town red ;o) ) and here it is on Susan’s trampoline on the way home. And here’s a look from the back, not sure if you can see the quilting any better right enough! Now it’s got hanging sleeves on, and you can find it on its holidays in Edinburgh at Jo Avery’s shop, where she’s holding a month long quilt exhibition to tie in with the Fringe Festival. Love it! 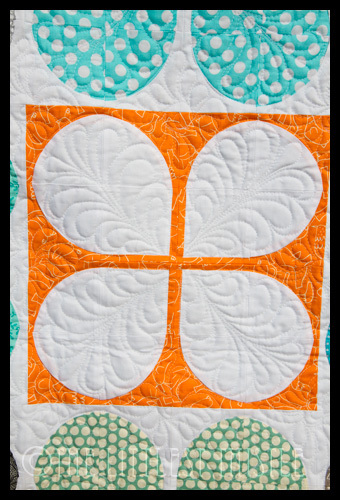 I must throw some more orange in my quilts! Love that zing so it was worth the wait and adore that reverse block Katy! A triumph worthy of participating in the Festival! It's beautiful and I am so glad I got to see it in person too. wow it is a beauty ! Well done to all who played their part in this fantastic creation – it really is lovely. It really is lovely and super funky. And the quilting don't look nothing like alien va-jay-jays now. At all. Honest. *g* Another Brit Bee triumph! That Lynz is one dirty biatch, I like her style! I think I should charge an appearance fee for being at the Fringe! This really is a spectacular quilt! 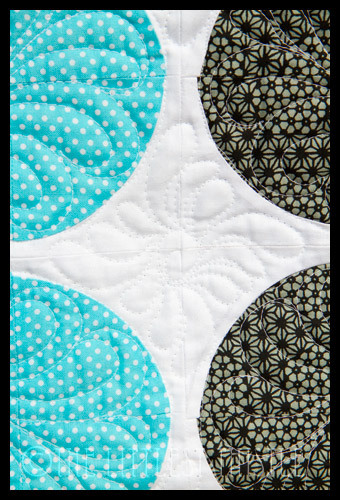 The quilting highlights the blocks beautifully. It's been fun watching this come together! Yay! It's fabulous!! Love all the feathery quilting! How cool that it's going to be on show for a month, it'll get a lot of admirers!! Absolutely beautiful. Its so eye catching – Im sure it'll be stopping people in their tracks. LOVE those colours. You (and the Brit Bee gals ) did a great job. 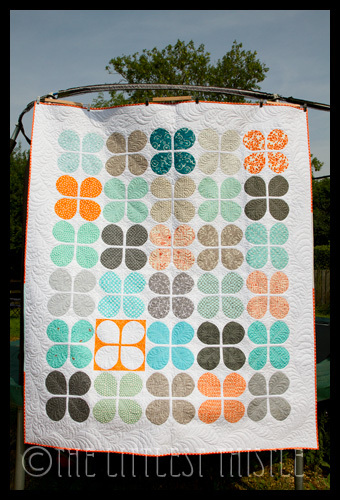 That quilting is perfect for that quilt. Thrifty is so happy and he loves the orange binding! Well it's beautiful – I love it! That is some seriously feathery awesome! Truly gorgeous, love everything about it! 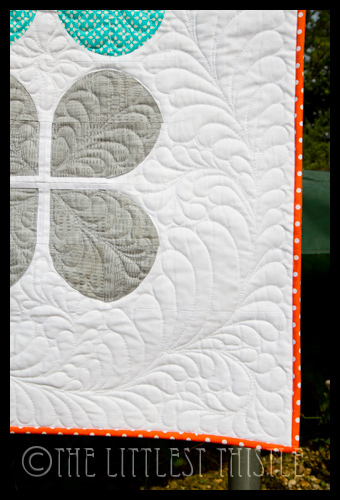 Absolutely gorgeous – Trudi does really beautiful quilting! That's beeyootiful! Is it always going to be a hanging quilt? It is absolutely fantastic! How nice it will be for you to snuggle under that masterpiece! That quilt is beautiful and I love the feathers in the quilting! It's truly lovely! I don't know how you can bare to send it away. Make sure you get it back in time for autumn snuggling. Long time in the making but well worth it, it is gorgeous! It's fabulous – well worth the wait! Oh its fab!!! I love it!!! Gorgeous! 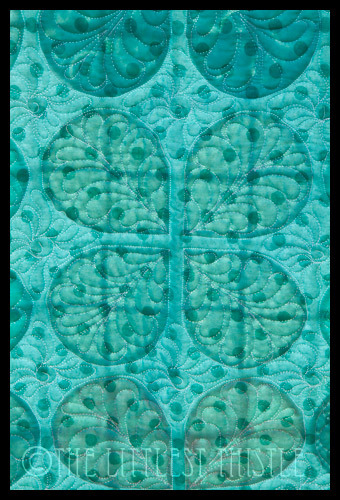 Such a beautiful quilt, and Trudi's quilting is amazing, as always. FANTASTIC! Great finish. Hmmm. . I wonder what my bee blocks would look like in a quilt. It is really lovely, Katy…and I love the feathers. Is it due to live on Katy's bed (when the weather turns colder)? Now come on, I'm sure I've seen this one before. are you recycling projects??! !